I’ll start with a confession. I have never seen any of the previous three versions of A STAR IS BORN. So, I’m coming at this with a nearly fresh take. Yeah, I know what the story was before I walked in. Aging music star, battling addiction discovers a vibrant young singer. They fall in love. And it doesn’t end happy. So what about the 2018 version directed and produced by, and starring Bradley Cooper? First the music is right in my wheelhouse. Alt-country, Americana… whatever you want to call it… is probably my go to sound at this point in my life. The songs were written or co-written by Lady Gaga, Cooper, Mark Ronson, Lukas Nelson (Willie’s son) and Jason Isbell just to name a few. That is quite an all-star list for this type of music. But there are also Lady Gaga pop songs in there, and I gotta tell you I am a fan. Ok, enough for now about the wonderful soundtrack because that isn’t even the best part of this movie. I came for the soundtrack and got so much more. Cooper stars as Jackson Maine. He’s the drug and pill addicted singer who is also dealing with tinnitus. And he’s not dealing with any of it very well. He walks into a drag bar one night in search of a drink and stumbles across Lady Gaga’s Ally. She’s a waitress with dreams of music industry stardom. And man does she have the chops, which Jackson quickly realizes. After Ally punches a cop in a cop bar, they wind up in a supermarket parking lot where they talk and Ally starts singing a song, seemingly improv’d on the spot. I almost broke down in tears just listening to Lady Gaga sing acapella. He flies her to a gig and nearly drags her onstage for her breakout, YouTube moment. That is the first single from the soundtrack “Shallow” which is immediately a frontrunner for a best song Oscar. Their love affair grows, her career begins to outshine his and Jackson alternates between drinking into a stupor and battling to stay sober for Ally. His struggle is real and heartbreaking. Meantime, she is off on a shooting star. Saturday Night Live appearances, Grammy nominations and huge tours. And Jackson just keeps screwing up by popping pills and downing booze. This whole film is just outstanding. Cooper is such a solid actor and he totally pulls off the perpetually drunk, stumbling around gruffness required for Jackson. And he can really sing and play guitar. He’s got chops. The amazing part is that he does this while directing his first movie. So you’d expect some things falling through the cracks. But it just doesn’t happen. This has got to be one of the best first-time directing jobs I’ve ever seen. Sure, other directors first time in charge have been excellent, but not on a stage as big as this or with the stakes this high. I’m more than impressed. Two of the supporting actors are excellent. The legendary Sam Elliot plays Jackson’s older brother/tour manager and brings an emotional depth I’d never seen from him before. Also outstanding is Andrew Dice Clay as Ally’s father. Lady Gaga is a force of nature, she always has been. I first fell for her during an SNL performance where she was in one of her usual Gaga costumes, but sat down at a piano and belted out a song that had my jaw on the floor. Now she is acting and I just don’t know where this comes from. She is outstanding. Granted, this character might not be too far from her own story. But the raw emotion and feeling she brings to the role just carries it to another level. This is THE breakout performance in this film, and maybe of the year. It’s weird calling it a breakout performance for an artist who has been around this long. Fans of her music and performances already know how captivating she can be. But you have never seen Lady Gaga like this. There is so much to love here. The cinematography by Matthew Libatique is perfect. Every shot is framed to enhance the two stars personas. The adaptation of Moss Hart’s original story by Cooper, Eric Rpth and Will Fetters is just great. Jackson’s backing band is Lukas Nelson and the Promise of the Real. If you haven’t heard their music, search iTunes or Spotify. The movie even has an adorable labradoodle! I mean c’mon!!! 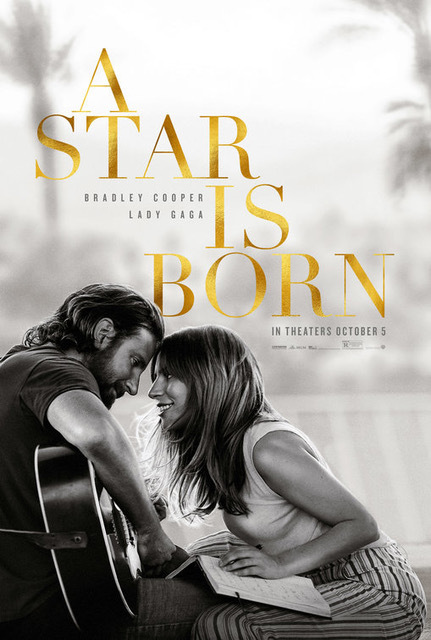 A STAR IS BORN is kind of meta as a title for this movie. Gaga is born (or re-born or maybe Born This Way) as a movie star. Cooper is born as director. And they both have given birth to one of the best movies of 2018.